(Makes 5 gallons) A classic Porter recipe and a fantastic first dark beer! A super drinkable, smooth, delicious beer that everyone loves. Chocolate and Black Patent malts are the defining malts that give Porter its dark color and roasty flavor. Our recipe also features dextrin powder which gives it a creamy body. The Northern Brewer hops impart a nice, but not overpowering, bitterness. 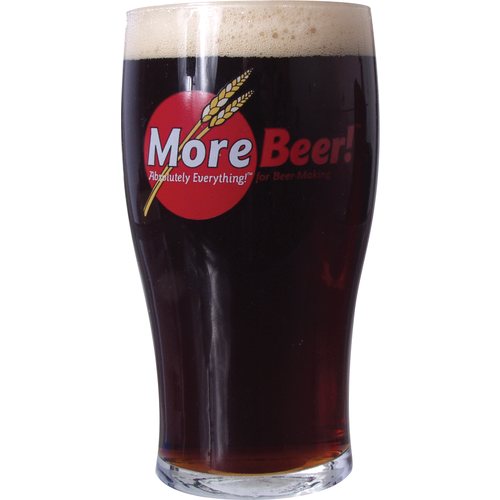 This recipe was designed by Regan Dillon, original MoreBeer! partner, whose favorite beer style was Porter. Regan has made this Porter recipe since the 1980's so you can be assured it has passed the test of time. Jamil Zainesheff, owner of Heretic Brewing, said this Porter was the first inspiration for his future Porters, such as Shallow Grave. High praise! Want to make a tasty brew for the company Christmas party. I like porters, esp. in the hot Pasadena summers. Jazzed it up a bit OMG!!!! Bought the porter kit because it was on sale. I deviated from the recipe a little. I added 8oz of American two row with teh other grains in the kit. I also added 1oz more of cascade hops at the end of the boil. After fermentation had stopped I added 3oz of lightly toasted oak chips that had been soaked in rum (chips soaked for 3 weeks in a sealed jar). The chips sat in the fermentasaurus for 8 days (in mesh bag). Bottled after total of two weeks. Let bottles rest for 8 days. I use a few 12 oz bottles for testing. Popped one on Monday and it tasted so good I would have slapped my granny. Should be even better after another week in the bottles, if it lasts that long. Thank you so much for your feedback. We are glad that the modified recipe turned out well but we hope that any "granny slappin'" is reserved for the imagination. We really appreciate the honesty and value great feedback like this as it helps us improve our products. Cheers! I do some modifications but love it for the base. On to all grain brewing now. I am usually an all grain brewer, but I wanted to make a quick porter for a large summer party and I wanted it to be a coconut porter. This recipe fit the bill. Made per instructions, then at flame-out added in 24 ounces (2-12 ounce bags) of Bob's Red Mill Shredded Coconut Unsweetened that I had purchased on Amazon and toasted in an oven lightly. My bazooka screen in the boil kettle effectively screened out the coconut into the primary ferment-er. I didn't have a lot of time so I didn't want to mess with dry hopping coconut, simply adding at flame-out did the trick. I fermented out for 7 days with Safale US-05, then cold crashed for 2 days ( I have a modified small chest freezer with temp control), at 35F there were fats on the top of the carboy from the coconut, but dipping below that with a racking cane enabled me not to transfer hardly any fats (that would cause a loss in head on the beer) to the keg. Pulse charged the keg for 36hours at 37F and 30PSI and it was ready to serve at 10PSI .. it was a hit! Brewed this Porter for my second ever batch of beer and it turned out excellent. Next time I'll try and add some vanilla and see how that comes out. We upped the chocolate to 10oz, and added some Munich malt to make somewhat of a Heretic shallow grave lite clone. Turned out amazing. Bottling - tasting was roast / chocolate. This is a really good beer, and becomes better the longer it ages. Love the northern brewer & cascade hop additions. If doing again, I would add some CaSO4 to the steeping to reduce tannins from the grains. I really really enjoyed this kit. I have no complaints and I will definitely brew this again. If you like Porters give this a try. What temperature did you store at? If you cold store to soon can affect carbonation. Just ordered my second one of these. Just need to finish the first keg of it. Yummy. Being a huge fan of darker beer, I had to give this one a try. Needless to say, I was not let down. Tastes good in a bottle, looks even better in a glass. I liked it enough to buy another kit and will probably continue to do so routinely. brewed this kit a while back and added 3.5 Marris Otter Extract and 1 oz UK Goldings. Just Bottled beer and finished out at 5.502 ABV%. Taste of brew was just awesome, smooth malty with just the right kiss of hops. Can't wait for it to age a little. Kegged 2 gallons and put the rest in bottles for a good long age to really let the flavor get right. The anticipation is gonna kill me!!! 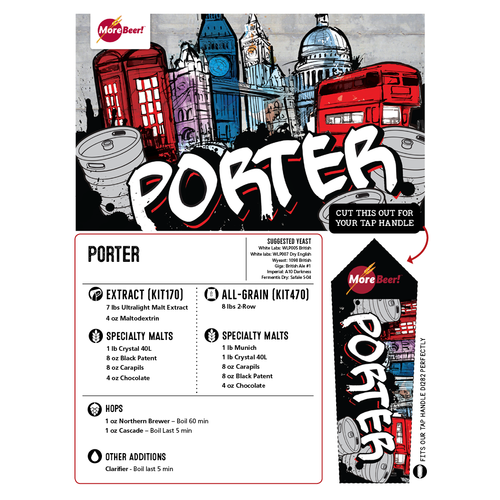 We wanted to create a Super Chocolate Porter and used this kit as the base. The instructions are easy and we were guided by the staff at MoreBeer to add about 10oz of Chocolate syrup at 5 mins to go in the boil. We added 13 and will probably add more next time. Also added 4 oz of Cocoa Nibs in the fermenter with Edinburgh Ale Yeast from White Labs. Super smooth and gains more Coffee flavor as it ferments! The neighbors are lined up for our next batch already! 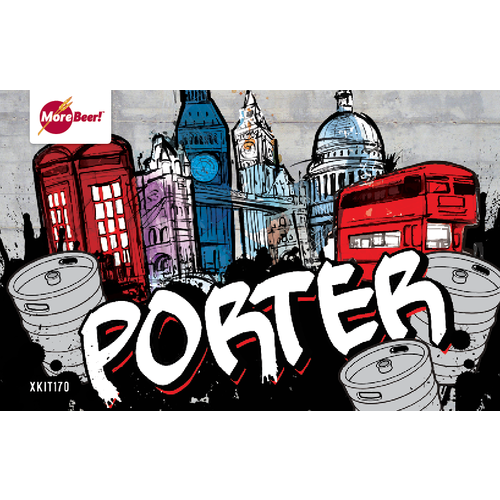 I love porters, brown ales and stouts! I have been home brewing for twenty years and was craving a porter. I saw this kit on the website and decided to give it a try. I wasn't disappointed....a full bodied porter that comes with everything you need. Very good beer! It came out real good. I intend to brew it again in the winter. Good stuff. I've made a number of batches of this Porter and am very happy with the results. I ususally try different beers but keep coming back to this one because Sue who is normally a wine drinker really likes this brew.